Viking Vets - Ophthalmology Services - Your local vet based at Chevening, Station Road, Henbury, Bristol BS10 7QQ. Retinal image of a dog with generalised progressive retinal atrophy. 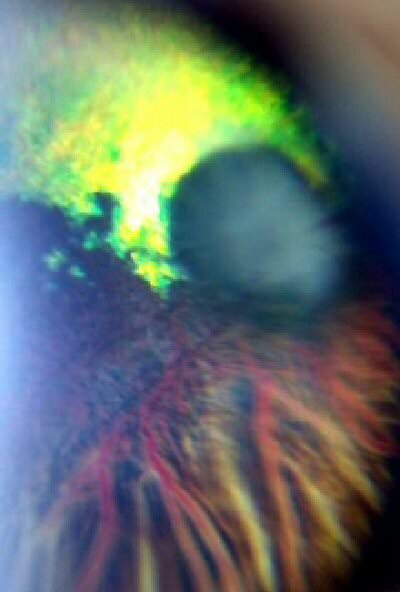 Retinal image of a cat with chorioretinitis. Vicki has a particular interest in ophthalmology and after completing a year-long training course, obtained the general practitioner certificate in ophthalmology in 2012, awarded by the European Society of Practising Veterinary Surgeons (ESVPS). This has broadened the scope of the services we can offer here at Viking Vets. Vicki takes internal referrals in ophthalmology cases as well as providing ongoing continual professional development for other team members in this subject, improving the scope of the ophthalmology care that all the vets can offer. cataract diagnosis and monitoring- referral for cataract surgery can be arranged locally. enucleation (removal) of blind, painful eyes or in cases of cancer. ultrasound of the eyeball. This is particularly useful when the view into the eye is obscured, or to examine behind the globe. a slit lamp - a hand-held microscope with an adjustable beam and a range of colour filters. This allows x16 magnification of the front section of the eye and eyelids as well as assessment of the thickness of the cornea and other tissues or lesions. surgical loupes which allow magnification during surgery, improving surgical technique and enabling intricate corneal surgery. fine surgical instruments for use on the cornea and conjunctival tissues. an electrolysis unit which, alongside the surgical loupes, can be used to remove abnormal eyelashes (distichia). a schiotz tonometer for measuring intraocular pressure, which aids in the diagnosis and monitoring of glaucoma and uveitis. 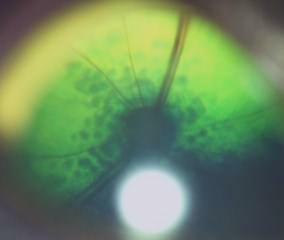 a corneal burr which may be used to debride non healing corneal ulcers as an alternative to the traditional technique of grid keratotomy or chemical cautery, techniques which are also used on a case by case basis. Vicki is also continually photographing eyes and has managed to photograph some fantastic retinal images, which aids in monitoring of retinal diseases. Ophthalmology is such a visual subject, photography can be extremely useful as part of our record keeping and monitoring of cases. 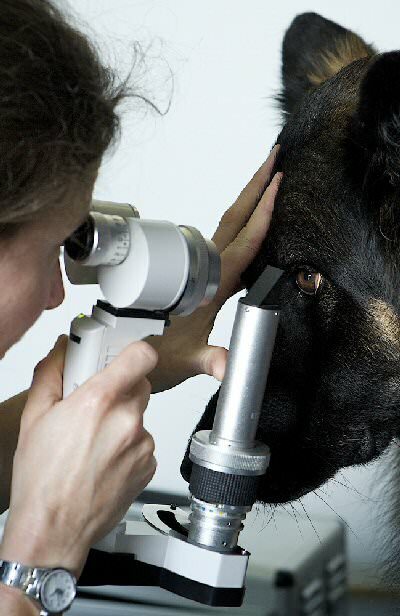 We have an excellent relationship with a local veterinary ophthalmologist and are able to offer referral for more specialised procedures such as cataract surgery and surgical glaucoma options.